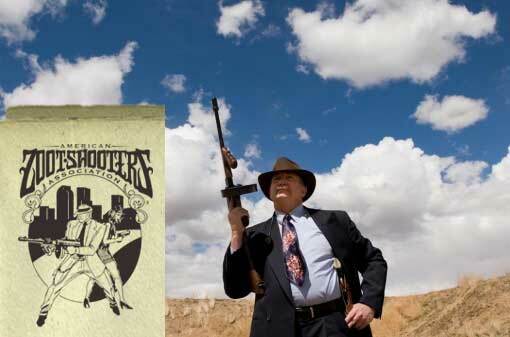 American Zoot Shooters Association is bringing back the Roaring Twenties! AZSA is a multi-gun sport in which participants dress in 1920s-1930s costumes and compete against the clock engaging targets for the best possible score. Zoot Shooters must use firearms that are correct for the time surrounding Prohibition. Costumes may be of any character type reflecting the era (i.e. gangster, law enforcement, flapper, bootlegger, politician, etc.). Looks like those guys have a lot of fun. Awesome. Does that music always play in the background during the match? Very cool. Most shooters appreciate the history of firearm designs, and this adds context (and class). It’s also good to see a tactical shoot that doesn’t look like a Multicam fashion show. Cool that they seem to make them fire one-handed, although all that weak hand bracing lark is clearly out of period. Ironically plenty of ‘modern’ shooting technique (including two-hand grips) in ‘Shooting to Live’ that should be allowable here! I’d go with a Winchester 1907 in .351. Yes you’d have to reload, but at least it’s designed for the longer barrel. A Thompson with a 16″ barrel is a monster! Then a couple 1911s in .38 Super. Although their rule about rifles being under 1,400fps would mean a very heavy bullet / light charge in the .351 as it will throw a 180gr bullet to over 1,800fps. Strange limit — a BAR clone made up to look like a Colt Monitor would be awesome if not for the velocity limit!